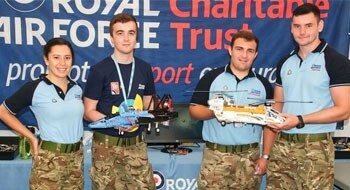 Members of RAF Leeming in North Yorkshire have come to the Royal International Air Tattoo (RIAT) to showcase why the STEM (Science, Technology, Engineering, Maths) subjects are so important. Last year, the station received £37,750 from the RAF Charitable Trust to create a STEM hub and now they are on a mission to inspire young people to get involved. The creation of the hub was the first of its kind and has provided young people with the opportunity to participate in STEM workshops and events. It was developed in line to support RAF100 celebrations and has already played host to a wide variety of events including a robotics workshop and the 'Race to the Line' regional final, which saw 280 year seven students build and then race foam rocket cars against their rival teams. The two finalists, Withensea and Boroughbridge secondary school competed in the national finals day at RAF Wittering on June 18 but in the end, Boroughbridge were victorious. RAF Leeming Flying Officer Lauren Kerslake said: "We have come to RIAT to encourage young people to become more interested in the STEM subjects. "Engineering in particular, is an understated specialism but so important. A lot of children don't like maths but hopefully we can show them how it can be fun and inspire them to pursue a career in engineering."